Ocean Fortress Desalination Plant Powered By Super Watt Wave Catcher Barge. Offshore Islands Limited provides traditional offshore engineering services for the design of most types of fixed and floating offshore platforms including: Jackets, Towers, Jack-ups, Semis, TLP's, FPS's, FSO's, FPSO's, SPM's, Spar Buoys and Tension Leg Counterweight Platforms (TLCWP's). These services include associated surface and sub-surface hardware like subsea trees, flow-lines, risers, umbilicals, pipelines, subsea manifold centers, etc. 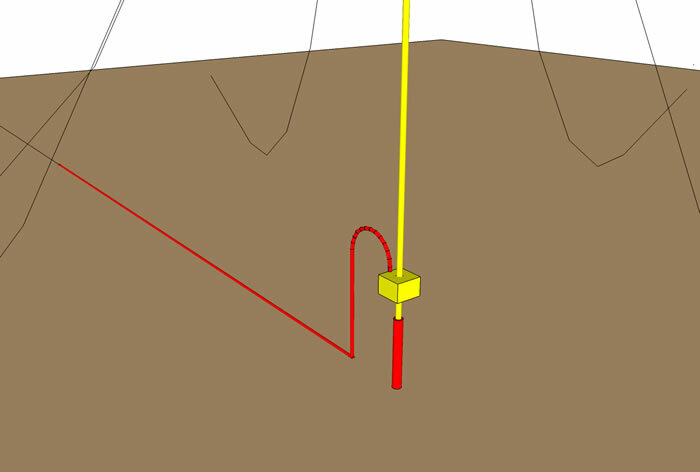 Offshore Islands Limited has a new deep water mooring system and hull design we call the "Ocean Fortress" that is faster and less costly to fabricate, transport and install than other types of floating offshore structure. 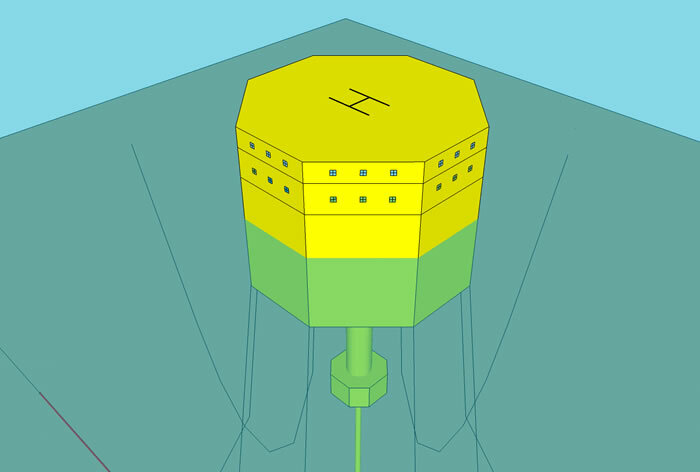 The "Ocean Fortress" provides the lowest costs for payload capability, high stability and low vessel motions. Excellent support for a Floating Production Storage and Offloading Plant, Floating Desalination Plant, Floating Hotel, Floating Chemical Plant, etc. If you are an oil and gas producer, please contact us for help with lowering your offshore field development capital cost and operating costs. If you are interested in a floating offshore island for almost any purpose in shallow water or ultra deep water, we can help. 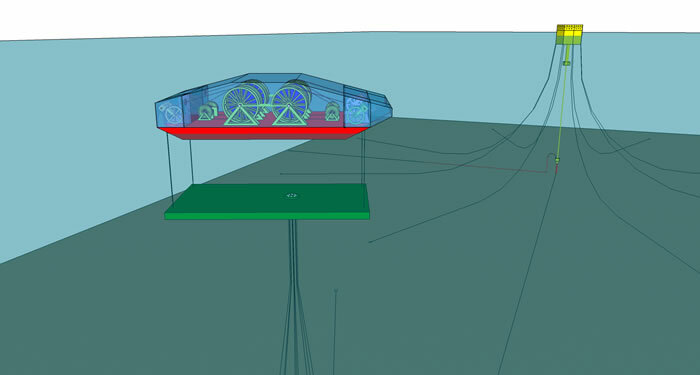 Click here for Ocean Fortress© FPSO or FPU Presentation. 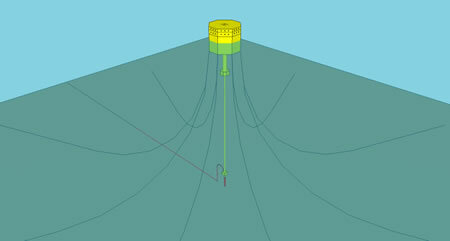 Click here for "Ocean Fortress" Desalination Plants Powered By Super Watt Wave Catcher Barges. Marine Energy Corporation is a subsidiary of Offshore Islands Limited and specializes in the design of high capacity marine power generator support systems for most water depths, environmental conditions and soil conditions worldwide. 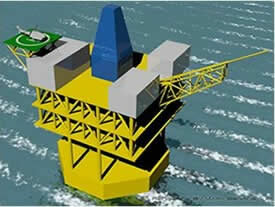 Marine Energy Corporation uses offshore platform design, fabrication, transportation and installation technology. Click here for Marine Energy Corporation Brochure. Marine Energy Corporation has "Super Watt Wave Catcher Barges" that are currently able to support over 24 megawatts of marine power in high wave environments and "Current Catcher Pontoon Barges" that can generate over 24 megawatts of marine power in high current locations. 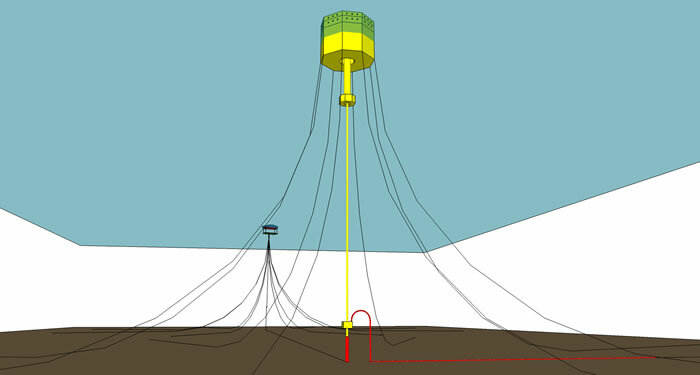 Under ideal conditions of: high waves or high current velocities; low water depths with pile or drag anchor friendly seabeds, the resulting cost/megawatt is lower than land based wind power which is lower cost than offshore wind power. Countries with significant offshore wave conditions or high velocity current conditions can provide a significant percentage of their country's power from Marine Energy. 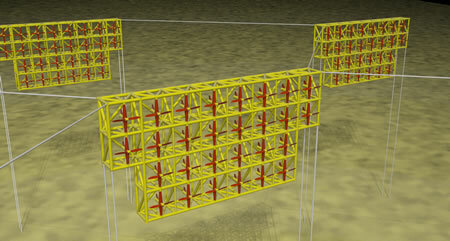 If you are a power company operating in coastal states and planning on new power plant options, we suggest you consider marine power that is now the most cost effective new power plant and definitely investigate the lowest cost power plants to date the "Super Watt Wave Catcher Barge" and the "Current Catcher Pontoon Barges." We have a huge power source on your doorsteps which is now able to provide significant power. These barges can initially be anchored near shore where the cost will be the lowest and later farther out to sea benefiting from the nearer shore infrastructure. 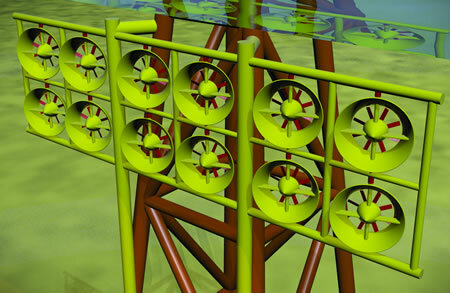 "Super Watt Wave Catcher Barges" can be moored in ultra deep water opening up a large part of the ocean for power generation. 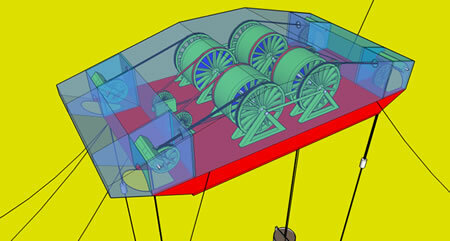 Initial near shore "Super Watt Wave Catcher Barges" have lower costs than land based wind power. Like offshore platforms, MEC's "Current Catchers Frames" use buoyant steel tubular frames to support numerous proven marine current generators. These frames can be fully pre-commissioned and tested onshore, loaded onto large submersible Heavy Lift Vessels (HLVs), transported to site, float-off offloaded, towed to site, flood and upend at site and attached to its pre-laid moorings. 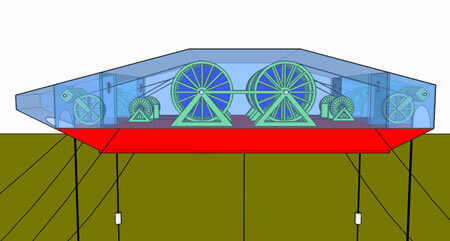 The "Current Catchers" can be turned on after the power cables are connected. The offshore installation of one of these systems should take less than 2 days. MEC has "Current Catchers Frame" designs for shallow water tidal locations, non-tidal shallow water river locations, medium depth locations and deep water open ocean locations, and they all use the same principles of economies of scale and lowest possible installed generator support costs. reduce your carbon footprint and reduce your fuel cost, now and far into the future. diversify your power supply needs now in preparation for declining fuel supplies. prove these systems prior to large investments. provide invisible, longest lasting, environmental friendly and high output current and wave power generating systems. 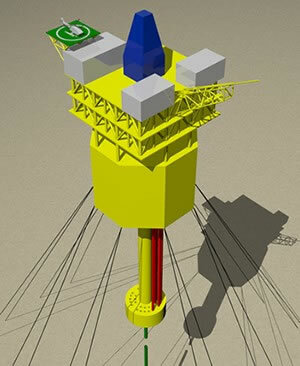 power offshore hydrocarbon production systems without burning hydrocarbons including down-hole pumps and compressors. lower or eliminate carbon emissions taxes. provide power at predictable and near constant prices without increasing carbon footprint and fuel costs. delay offshore platform decommissioning in favor of new profits from enhanced reservoir recovery powered by alternative energy. Contact us if you would like to know more information about these systems and how they may fit your plans for the future.